ST Foundation’s focus has been once more all on its Digital Unify (DU) program in 2010 in order to maximize its impact, leaving aside any support to other initiatives in order to respect the given budget restrictions. 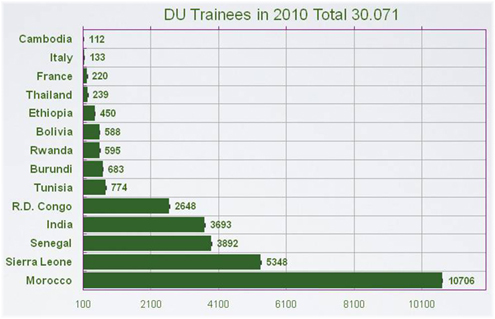 The past twelve months have been extremely profitable for DU, with over 30’000 trainees completing the Informatics and Computer Basics course (ICB) since the beginning of the year, bringing the total number of DU beneficiaries to over 110’000. Two new projects have been launched in Congo Brazzaville and the Dominican Republic, bringing the total number of DU countries to 20. Morocco once more reached the highest number of beneficiaries, followed by Sierra Leone, who has the highest beneficiaries/lab ratio. 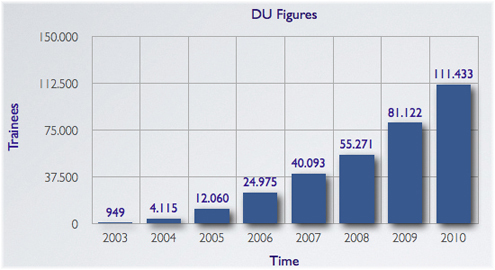 The DU program has reached the symbolic threshold of 100,000 beneficiaries worldwide in 2010. This great success has been made possible thanks to the joint effort of ST Foundation’s volunteers, partners and staff alike. DU India received new support from volunteers at ST Bangalore site. 11 ST employees have participated to the ICBF training taking place in February 2010. They now join the motivated team at ST Greater Noida for an increased effort in expanding digital literacy in India. There are currently thirteen active labs across the country. A Train-the-Trainer session bringing together French-speaking DU teachers from Burundi, Congo Brazzaville, Congo D.R., Morocco and Rwanda has been organized in Rabat in September 2010. The ICBF session has been a profitable opportunity for training, exchange and networking among trainers involved in DU in the different countries. ST Foundation has officially finalized the opening of a Liaison Office in Morocco in order to ensure a better support of local activities. ST Foundation currently supports twenty-eight labs across the country. New DU projects kicked off in Congo Brazzaville and the Dominican Republic. The training of trainers has been possible thanks to ST Italy volunteers. The labs are expected to be fully operational beginning of 2011. The ICB Manuals Update Team is pursuing the review and update of training material in cooperation with the Foundation’s staff. The purpose of its work is to review the DU basic informatics course and to collaboratively create a uniform, updated standard to be used in DU labs worldwide. The new material is expected to be delivered in the first half of 2011.